Happy weekend, friends! Next week I'm going to share a walk-in closet turned playspace overhaul with you, so I thought I'd share a fun little art project for my little girl's room that will tempt to you return for more. 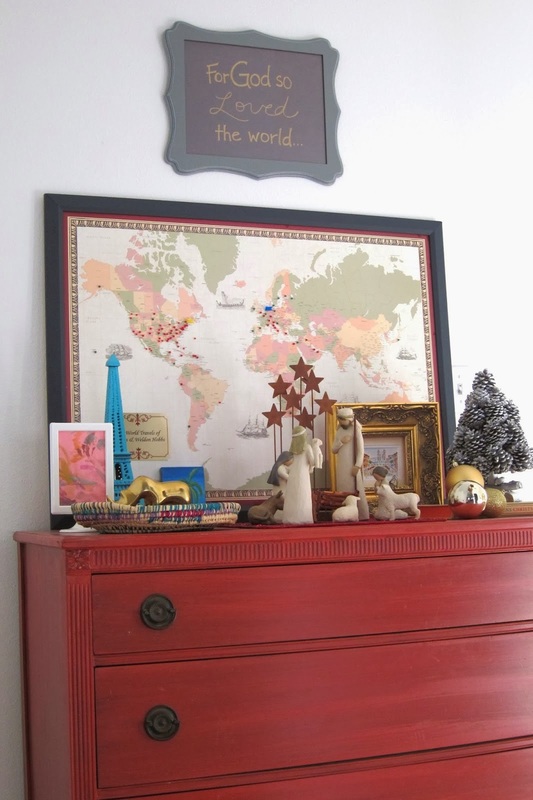 Remember this cute gray frame I found on clearance at Michael's and had above my world map for Christmas? Well, I decided to reuse it (don't worry I saved the "For God so loved the world..." print too). To fill the gray frame I made another handmade "print" for our toddler's room inspired by a sweet Twinkle Twinkle Little Star re-mix phrase I saw on Etsy the other day. I know it's not fine art - sometimes simple is better - but I couldn't resist the "twinkle twinkle little star...do you know how loved you are?" wording. Twinkle Twinkle (as we call it) is one of our favorite songs, so the phrase shot straight to our hearts. And there she sits above our little DIY book sling in the reading nook. Sweet little addition, huh? Hope you have a wonderfully blessed weekend! I love it, my little "Up, up, up the sky so high" girl!